"Who Can find a virtuous woman, for her price is FAR ABOVE RUBIES" This infinity solid 14K Gold mobius strip, with the verse from the song of songs "Ani Ledodi Vedodi Li" - I am to my beloved and he is mine, expresses the infinite love between a man and a woman or between human being and God. Now available with two Genuine Rubies! 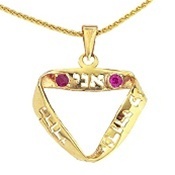 Each pendant is hand crafted in Jerusalem / Israel by Orna Porat. The letters are carved out from the pendant. Additional 14K Gold chain is available in different lengths! Height: 1'' inch / 26mm Width: 0.85'' inches / 22mm Usually ships in 3-4 weeks. 780-P22 14K Gold Pendant with 14K Gold Box Chain - 22"
780-P24 14K Gold Pendant with 14K Gold Box Chain - 24"
780-P18 Infinity Mobius Love Pendant With Rubies 14K Gold Pendant with 14K Gold Box Chain - 18"
780-20 Infinity Mobius Love Pendant With Rubies 14K Gold Pendant with 14K Gold Box Chain - 20"